Christmas 2018: The Truth Will Set You Free. The truth was born of a virgin in the town of Bethlehem. Truth has become a bad word. In our modern world or post-modern, whatever stage of modern we are at, the truth cannot even be spoken if it offends the ears of anyone who hears. The great enlightenment (post-enlightenment) has given us the gem that there is no truth. We (meaning the human race) hate the truth because the word itself speaks of absolutes, and absolutes may not agree with our worldview, and that insults us. Everyone, as fallen sinners, eventually turns to lies and fails to practice the truth. We come to live as though we are alone in the world. We think we have the truth in ourselves. Others do the same and we hate them for it. We see ourselves as the center of the world and others as our subjects, and this, coupled with our hate, drives us to seek aloneness. You wish to be alone, self-sufficient, and you hate others. Fallen man: If you could just tear away, be alone, dismiss others and God, then you would be free. This is your lie. You crucified the truth. This leads us to our execution, which swiftly follows our judgment. Such was Sennacherib, the king of Assyria, whom God used to punish Israel. Sennacherib was sure that he was wise and strong all on his own. What would he be if he stood before the manger holding the King of Kings? ISA 10:12 So it will be that when the Lord has completed all His work on Mount Zion and on Jerusalem, He will say, "I will punish the fruit of the arrogant heart of the king of Assyria and the pomp of his haughtiness." And there was not one that flapped its wing or opened its beak or chirped." ISA 10:15 Is the axe to boast itself over the one who chops with it? Is the saw to exalt itself over the one who wields it? Or like a rod lifting him who is not wood. And under his glory a fire will be kindled like a burning flame. "As the gods of the nations of the lands have not delivered their people from my hand, so the God of Hezekiah shall not deliver His people from my hand." 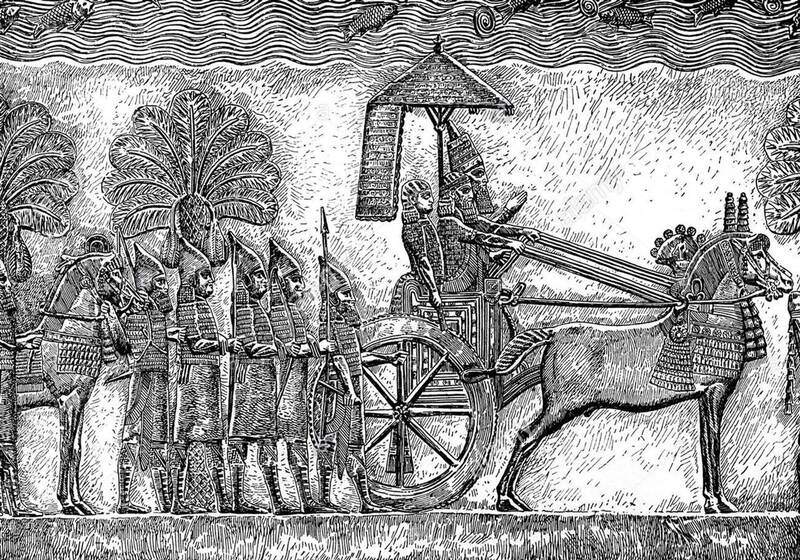 Sennacherib in his chariot. British museum, actual relief from the palace in Nineveh. This city was first founded by Nimrod in Gen 10. The location of Nineveh, once the largest city in the world, is right across the river from Mosul in northern Iraq. You have heard of Mosul if you read the news because it was captured and ruled by Isis for several years. It went from a great kingdom to an area run by terrorists. God pulls down kingdoms. In all kingdoms, no matter how good or noble they begin, the greedy rise to the top and the kingdoms always fall. For those who are not greedy who are humble and desire goodness and righteousness, if all kingdoms fall, what will be left for them? The truth says that the rich are not rich, but the poor in spirit are. The truth says that the mighty are not powerful, but the meek are. The truth says that noble are not great, but the humble are. This is foolishness to the proud man. The Lord chose His twelve disciples, thus separating them from the crowd, and then began to teach the character of His disciple. MAT 5:1 And when He saw the multitudes, He went up on the mountain; and after He sat down, His disciples came to Him. MAT 5:3 "Blessed are the poor in spirit, for theirs is the kingdom of heaven. MAT 5:4 "Blessed are those who mourn, for they shall be comforted. MAT 5:5 "Blessed are the gentle, for they shall inherit the earth. MAT 5:6 "Blessed are those who hunger and thirst for righteousness, for they shall be satisfied. MAT 5:7 "Blessed are the merciful, for they shall receive mercy. MAT 5:8 "Blessed are the pure in heart, for they shall see God. MAT 5:9 "Blessed are the peacemakers, for they shall be called sons of God. There was a time when the throne of God was a feeding trough in a cave somewhere in little Bethlehem. That throne greatly frightened the powerful and rich King Herod. God brings down thrones and lifts up the humble. We must patiently wait for Him. Wait patiently for Him. The great kingdom of God is in your hearts. LUK 21:28 "But when these things begin to take place, straighten up and lift up your heads, because your redemption is drawing near." The Lord instructs those who are in the horrible world of the Tribulation to wait for Him. It will be only at this “second coming” that the earth will be made His kingdom. Yet now, that kingdom lives in our hearts. Be patient. The glory of that kingdom will arise in your heart as you wait to see what God will do with you. For the present, we are in the enemie’s kingdom, behind enemy lines, and it has not yet been revealed what we shall be. Be poor, meek, humble, mourn, be gentle, hunger and thirst for righteousness, be merciful, pure in heart, and be peacemakers and wait and see what you will become. Mankind: We don’t need the love of God. That’s an insult! Mankind’s lies hate the love of God because it says to us that we need it and that we will not live without it, but we are sure that we don’t need it. And so, the love of God insults us. It stabs at our truth and we hate it, mock it, make fun of it. God says to these men, to all of us, that we need Him, His truth, and His love or we will not live, and we take that as an insult. The truth pierces the heart of man. Some approach the manger of the infant Lord with awe and others with fear. One walks away whole and full of hope and the other is dashed to pieces. HEB 4:12 For the word of God is living and active and sharper than any two-edged sword, and piercing as far as the division of soul and spirit, of both joints and marrow, and able to judge the thoughts and intentions of the heart. HEB 4:13 And there is no creature hidden from His sight, but all things are open and laid bare to the eyes of Him with whom we have to do. God says to these men, to all of us, that we need Him, His truth, and His love, and we take that as an insult. We are slaves in fetters because we live in the lie, and the lie is full of hatred. We formed the chains ourselves, like Jacob Marley, and we have enslaved ourselves. Life is grace and truth and love, and since we lie, we are selfishness and hate, in fact murderers, though we may not have blood on our knives. This is why mankind is his own worst enemy. No matter what others have done to us, we have made our chains and we alone have enslaved ourselves. Our lie is that we are sure that we are a kingdom unto ourselves and that all others should be our subjects, though apparently they don’t seem to know that yet. We look at a picture that has five people in it, including ourselves, and the first person we look at and judge is ourselves. We wonder what people think of us. We desire that they think well of us and even desire us. This adds anxiety to our slavery. Our slavery: Lies, hate, selfishness, and anxiety, foolishness, and blindness. We do not see our slavery. We are quite sure that we are free. This makes us fools and blind. Lies, hate, selfishness, anxiety, foolishness, and blindness. It doesn’t matter what we say. It is not our words that make us liars, although we do that, but it is how we think and what we do that makes us liars. God tells us all of this. He points in our in His matchless and marvelous grace and we deny it, ignore it, and hate Him for it. We must be set free. It is not something that we do. It depends not on our courage, our family, the church we were brought up in, or what anyone else says that will make us free. Jesus said it plainly, “The truth will make you free.” God’s truth will make us free. JOH 8:32 and you shall know the truth, and the truth shall make you free." Becoming free does not mean becoming great in the world. It is not becoming free from your brother, but to be free from oneself, from one’s lie. It means being free from thinking only of myself, from being the center of my world, free from my hate. It does not mean being free from one another but to be free for one another. Only God can cause me to see the truth of reality and see others as the really are. Our image of the world and others was twisted. The light of God’s truth will set our eyes straight that we may see. The men and women thus freed have the truth, they love, they are exceedingly gracious, they are at peace, they are wise, and they are enlightened concerning all things. They are innocent as doves, or as children if you like, and wise as serpents. They are the revolutionaries of this world. Their words are the explosions and they are the most dangerous thing to Satan’s order or kosmos. They are the light of the world, and they know that the world is drowning in lies. They seek them out and try to set them free. This can be costly and painful at times, but their love prevents them from stopping or keeping quiet. Their disturbance calls forth hatred from the world. To God they are heroes, but to the world they are not even close. These are not the kind of people that the world seeks to honor and praise. They see the freemen as enemies to be done away with, outlawed, and in some cases killed. Yet, every man will have to face the cross. Think of a group of miners who are stuck in the earth because the mine collapsed. They know that people are above them, feverishly digging through earth and stone while wives and children cry. Will they be free in time, or are they standing in their graves. What do they feel when they hear a voice and the sledge hammer smashes through their prison? Think of the person serving a life sentence in prison whose life is hard labor. He cannot escape and all he thinks of is freedom, but then the warden tells him that he is free. Think of the person who has a terminal illness and is told he has only months to live and then the doctor tells him he’s cured and can go home. But then again, think of those who are in deep depression. Think of those who have a secret sin that crushes any self-worth. Think of those who are guilty with unforgiven sins and who have lost the feeling of life, and because of it, all happiness and joy are gone. Think about ourselves. We usually live a Christian, obedient life, but from time to time we betray it. Think of the son who cannot look his father in the eye, or the man who cannot look his wife in the face because he is guilt ridden with failure. All of the things like these (sin) pile up in the world and make for almost limitless destruction and hopelessness. "Behold, this is our God for whom we have waited that He might save us. Are these just grand and pious words or are they real? Did not the Son of God allow Himself to be born into the world, in the most humble of stations, in order to save the world? These wonderful words are for those who know they are buried in the earth, in prison, sick, depressed, and guilty. Those who see the courier on the mountain coming with the gospel finds no need for him and is bothered by him. Those who hear the promise that God is going to swallow up death for all time, and don’t wonder how or when God would do such a thing, has no need for such words, he finds them childish and insulting to his intelligence. The shepherds and the Magi all ran to see. Herod remained in his palace and gave orders for all the boys to be killed. The Son of God came into the world to break through all of these lies. He is the rescuer who is digging to get to you. He is the pardoner, who takes your crime upon Himself and sets you free. He is the physician who heals you. He is the one who takes your depression and gives you joy. He is the one who takes your guilt by forgiving you all your sins. He has come to soften hard hearts. What does Christmas mean to us? Is it shopping and hustling to get everything done? Is it a bit of sentimentality? Is it the lifting of the spirit within us? A little kinder mood? Perhaps it is loneliness and terrible memories? Christmas should be a time of remembrance. We remember the birth of the Savior and wonder that He came into the world in order to set us free from all that is sinful, evil, and bad. I hope for some that it will become a time of rededication. Perhaps some who are saved but have hardened their hearts toward God and His word will remember that the Son of God came into the world just for them. And that He delivered them from the things that have been hurting them for too long. I hope that for us who have been striving to life the life of Christ will remember that we are the light of the world and that the Son of God was sent into the world and then He sent us into the world to proclaim His precious gospel that the captives have been set free. The whole world celebrates this day. No other birthday is celebrated in every nation. Though some have tried to take Christ out of Christmas, there is no use to it, for they know the word as Christmas and not xmas or happy holidays. No matter what they say, on this day, the name of Christ is spoken in their minds. He comes to every person and whispers His deliverance. If they refuse Him and feel insulted by Him, then He must allow their freedom, after all, He is the one who gave them that very freedom. God makes clear that Christmas is not the miserable, weak, anxious Christmas of popular celebration, which we are so often contented with and which Christ deplores. The demand from God is to look up and see the messenger. The second demand is to receive his message of peace, happiness, and salvation. Look up, your gaze has been too much towards the earth. Look up, your salvation has been earned by your God. He has given it to you as a gift. It is unwrapped and not hidden. Look up, for your Savior has risen and sits in heaven. He is waiting for you to join Him. Look up for your life is hid with Him in the heavens. When you look up, things will look different. It is okay to be free from sin and death, though so many are not. It is okay to walk forward in salvation and freedom and to live as one who belongs to Him. We must be patient. When our Lord’s humanity discovered His mission of the cross, He didn’t run to Jerusalem and give Himself up for crucifixion. He so often said, “My hour has not yet come.” He was patient and walked confidently in God’s time. The fulfillment of our gift will happen at death. Don’t be anxious. One day at a time now. Keep your eyes on him and walk confidently in His time. Jesus has made His home with you. Take courage. The battle is not yet lost. Lift up your heads. Yours is the victory. Have no fear, no anxiety, no sorrow. Courage is your friend and ally. Make the victory sure. Be strong, be able. Because your Savior has come, there no reason to droop your head, no more doubts, no uncertainty of the way. Freedom, salvation, and deliverance have come. Are we going to look at all this as pious talk or is something really going to happen? Will human souls be put right? Will you give yourself the great gift of obedience to the truth?